I’m super fortunate to share with and learn from many nutrition students, interns and young dietitians who are heading down an entrepreneurial path in food and nutrition. Their energy and ideas are always inspiring! They often ask me why I chose this career in food and nutrition and how I knew it would be right for me. It truly has always felt more like play than work (at least 80% of the time!) Like for the happiest people I know, the best and healthiest career choice is the one that feels like an extension of your personality. An authentic representation of who you are and what you stand for. That said, it doesn’t mean you can’t change your mind along the way or still watch the clouds float by and dream about what else you might become when you grow up. My grandparents were Saskatchewan farmers after immigrating from the Ukraine and Norway. Although my 3 sisters and I grew up in the city in Saskatchewan, we always had a huge vegetable garden. We spent many holidays visiting friends and family on the farm. If there ever was a berry patch near any place we vacationed, guess what we were doing? Working from our backyard playhouse kitchen, the first ‘recipe’ I ever created was Carrot Coin Raspberry Snacks. Fresh-picked garden carrots, washed, sliced and made into mini ‘sandwiches’ with freshly squished garden raspberries as the filling. I was about 6 years old. To this day, this is what summer tastes like to me! When we moved to a new home in an area of the city that was just starting to be developed, while other people had big front lawns, we had a giant potato patch! What seemed a bit odd at the time, Dad was into edible landscaping long before it was trendy. When I met my husband and he shared that HIS Dad grew a potato lawn too we knew it would be true love! The first cookbook project I was ever part of was in grade 6. It was a Mother’s Day gift. I thought it was THE BEST project ever! Years later, Mom gave me that little cookbook and I still use recipes from it today. A large shelf in our kitchen holds my cookbook collection. I need to be creative to feel alive. Food offers tremendous opportunity for creativity – whether preparing it, sharing it, photographing it, inventing a new food product, advising, writing or speaking about it. My passion is making something from nothing. Bring on the 3-ingredient recipe challenges, creative uses for leftovers or food-based business ventures! A Christmas gift I received when I was 14 was a cake decorating set. I got totally into decorating cakes for family occasions. I thought those Wilton catalogs were sooo beautiful! I still use that same set today. In highschool I became interested in being a teacher, like my Dad, but was also thinking of becoming a doctor. 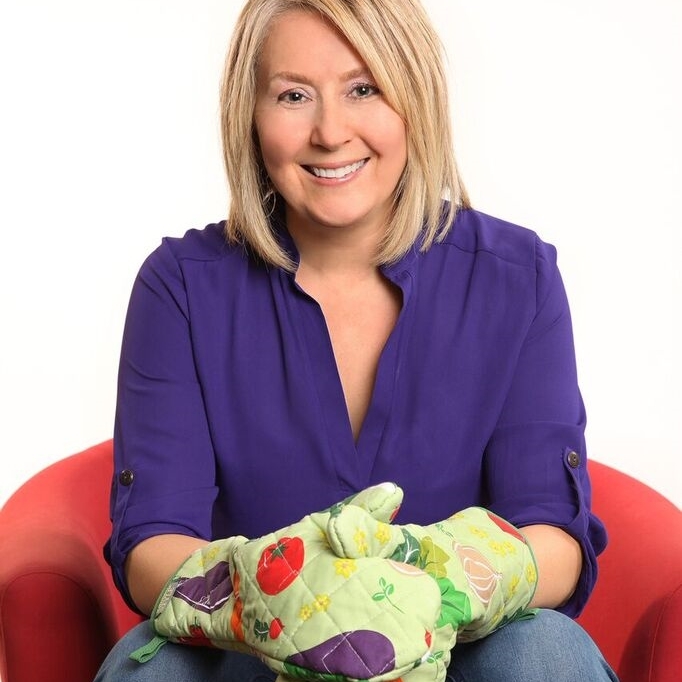 When I found out about the (then) College of Home Economics at the University of Saskatchewan, the food and nutrition program seemed like the perfect blend of both worlds. My calling was to use food to help encourage healthy people to stay that way. If I hadn’t chosen this path, I feel being a Home Ec teacher would have also been super rewarding. In University, I despised studying diabetes. At the time it seemed to be about mathematical calculations. I have long since realized that it is way more about food than math and that a diabetes-friendly way of eating can still be incredibly delicious. The more practical and less ‘mathy’ the guidance remains, the more success people have in living well with diabetes. Having counseled hundreds of folks, I’ve seen that the same can be said for the most part with nutrition for sport performance. I had success in that arena for keeping ‘nutrition’ messages food-based for my clients. Although I feel so sad for those who struggle, I also always knew the complex area of eating disorders was one I would never be able to specialize in. My favourite class of all was in the Foods Lab. Community nutrition classes, thanks to Dr. Shawna Berenbaum, were all awesome too. I taught cooking classes for teens as a summer job. I never used to think about going to culinary school. Cooking seemed so automatic to me…from an everyday home-chef perspective. I have tremendous respect for the amazing culinary experts out there who inspire me. I chose sewing over cooking in highschool Home Economics. Cooking seemed like something I already knew about. Today, I think more about culinary school than ever before and am ALWAYS wowed when able to experience a 5-star meal. ‘Health food’ tradeshows and old-school ‘natural’ food stores always turned me off. I disliked the scent and vibe in the air and avoided those places. It worried me when people knew I was a nutrition student and thought my future meant working in one of those terrible stores. To me, health didn’t mean having to have a home that smelled like a weird mix of stale dried herbs and minerals. In these places, it seemed like people spent more money on so-called natural ‘remedies’ than on food. A natural grocery store full of wholesome, delicious food, is a different story. I enjoyed 9 years working on recipes, food ideas and other well-being initiatives for a major grocery retailer and remain involved in the industry today. In grad school in the College of Physical Education, I became an instructor and taught fitness classes to make a little extra money while trying to keep fit. Although, throughout my life fitness has been the result of incorporating activity into daily life as much as possible rather than a prescriptive approach at the gym. Camping, gardening, walking or biking to school, lake swimming, games like kick the can, skipping and hide-and-seek, dancing like maniacs to every single song at any wedding or event, cross-country skiing on the prairies and teaching ourselves to skate on that slightly bumpy yet amazing backyard rink that Dad made over the garden every winter. My food memories are the strongest. For example, the first time I picked and ate a ripe pear right off the tree (a trip to California), begging to go to McDonald’s after church as a kid yet getting to go only very occasionally, my garage sale purchase of an Easy-Bake oven that I used to make tiny cakes for my friends…cooking with a lightbulb?!? We choose to live where we can have a large garden. We grow over a dozen different types of fruit and many vegetables. We have 3 freezers to help store all of the produce for use throughout the winter. We home-can food and also use a dehydrator for drying fruits and vegetables when the freezer is full. We have a small blueberry orchard at the family farm. I love seeing kids at play cooking in the kitchen. They’re into it and it’s much less messy than people think. The benefits FAR outweigh any minor mess to tidy up. Besides, they help clean up if you let them. As I write this I’m trying to dream up a memorable birthday party for a group of 11 year old boys centered on them cooking the meal. My favourite type of trip whether for vacation or work travel is anywhere that involves a farm, factory or seeing where food is made. I’ve been fortunate to go on many. I know I’ll get to the Reggiano Parmesan ‘factory’ in Italy and the olive groves of Greece one day. We are very careful not to waste food. I get excited about sharing practical food ideas and have had the opportunity to communicate frequently on this subject. When I dine with others, I’ve never studied what’s on their plate. I’m all about the togetherness and enjoying a ‘nourishing’ experience. Every exceptional dietitian I know is the same way. None of us want to micromanage what you eat. Instead, it’s all about enjoying delicious food and an overall healthy, active life. I’ve never been on a diet and dislike self-deprecating discussions about weight and calories. I surround myself with friends and colleagues who avoid those topics and put the energy towards more rewarding pursuits. I feel strongly that food beliefs and choices are very personal and a function of each person’s unique circumstances, finances, values, tastes, upbringing and more. I don’t think it is healthy to judge, upstage or try to force food values on others. Rather, support them if and when they’re looking for a hand from someone knowledgeable in making improvements. The less trendy, gimmicky or complicated the act of nourishing your family remains, the greater success. The more scientifically-sound the advice, the better! In my third decade of involvement with consumer food and nutrition issues, it has never been clearer that the harshest and loudest critics of the food system are the furthest from the farm. Those who grow at least some food, even basil on the kitchen windowsill, seem to have a deeper appreciation of what goes into growing wholesome food. I am increasingly grateful for my gardening ‘country mouse in city mouse clothing’ background!